I call this the fast and friendly breakfast. 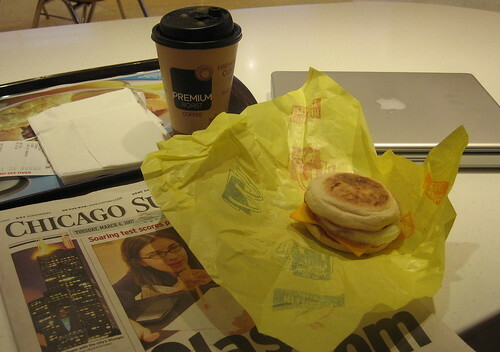 It consists of an Egg McMuffin, some Premium Roast coffee, the Chicago Sun Times, and free wifi ($4.14). What else do you need? Let me answer that – NOTHING! Actually, something sweet would help, like a cinnamon role or apple dippers with caramel sauce…nah, don’t do it John…resist the urge. I’m a firm believer that McD’s can be part of a healthy diet. Think about it please – the 400 calories I consumed between the Egg McMuffin and coffee with two creams and two sugars is a helluva lot better than the venti no foam caramel mocha latte with whip and an extra shot of peppermint flavor that many people have in the morning. By comparison, my fast and friendly breakfast has less calories, less sugar, probably comparable nutrition, a newspaper, and free wifi. Don’t know about you, but that spells SMART SHOPPER to me. Posted in food on 2007/03/13 by John.